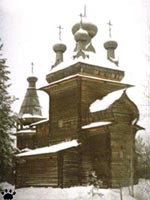 Church in Kostroma, Central-eastern Russia, c. 1790. 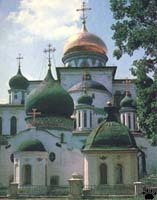 This is a small collection of photos of Russian churches, chapels and cathedrals, mostly from the northern part of European Russia. Some of them are well-known and included in tourist interaries, others are seldom visited. 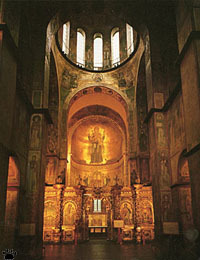 Cathedral in Chernigov, Ukraine, c. 1190. 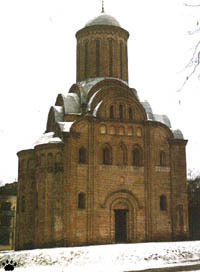 Cathedral in Chernigov, c. 1033. 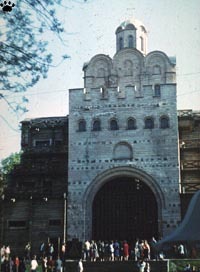 City gates and church, Kiev, c. 980. Pine-oak forests near Chernobyl, Ukraine. 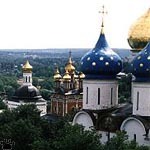 Part of Russia's cultural heritage, and its first capital Kiev, are now in Ukraine. 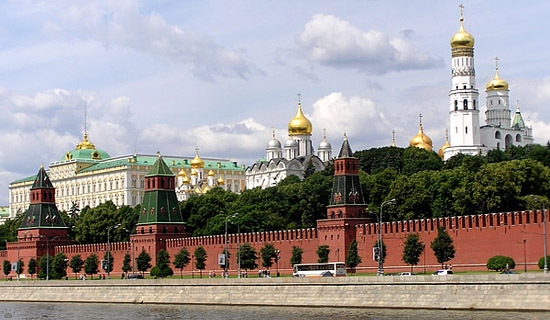 It was here, at the edge of forest and grasslands, that the Russian state formed, and began its millenium-long expansion in all directions, but mostly eastward. 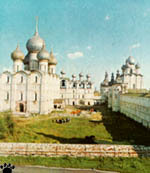 Kremlin (walled city) in Tobolsk, Western Siberia, c.1641-1700. 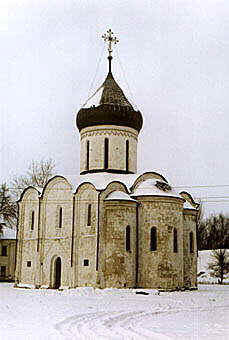 Church in Rostov, Central Russia, c. 1495.
c.760-790. 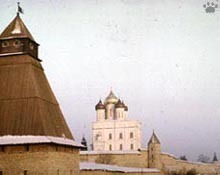 The first Russian churches resembled Byzantine prototypes, but soon, an original style was developed, probably influenced by phallic forms of pre-Christian temples, of which virtually nothing is known. Central Russia, c. 1157. 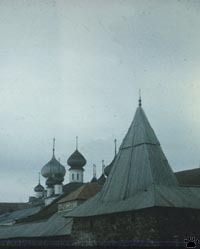 Vladimir, Central Russia (mostly c. 1158-1200). Central Russia, c. 1643. Pre-Mongolian architecture (11th-13th centuries) is particularly cherished. Most of it, and lots of more recent masterpieces, are now in the so-called "Golden Ring" of cities, northeast and east from Moscow. 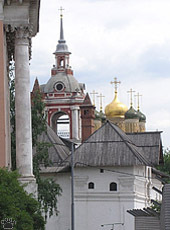 Among the Golden Gate cities, my personal favorites are Vladimir, Suzdal, and particularly Rostov. 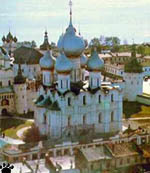 Views of Rostov Velikii (Rostov the Great), c. 1473-1570. 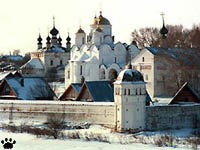 Pechory Monastery, near Pskov, c. 1473-1570. 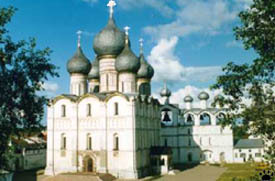 Cathedral, Novgorod, c. 1013. 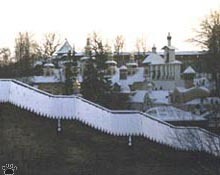 Pskov City, Northwestern Russia. Novgorod City, Northwestern Russia. 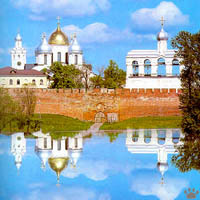 Pskov and Novgorod area of Northwestern Russia has some of the country's oldest walled cities and monasteries. 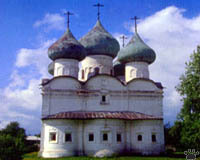 Cathedral, Novgorod, c. 1113. 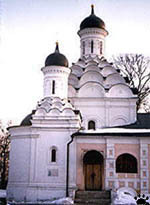 Church in Isborsk, near Pskov, c.1680. 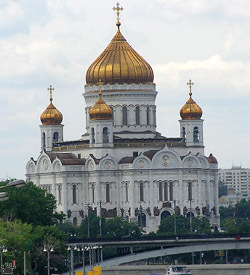 Cathedral in Moscow, c. 1559. 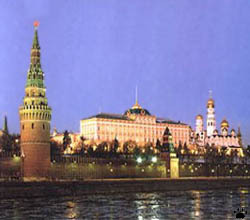 View of kremlin (walled city), Moscow. 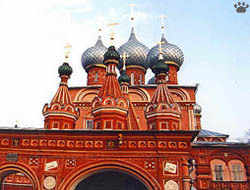 Cathedral in Moscow, c. 1559. 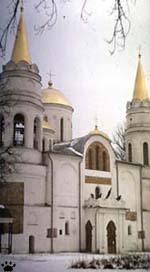 Church in Moscow, c. 1498.
c. 1470-1700. 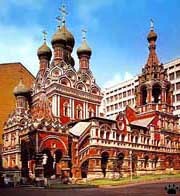 Moscow, the modern capital, is much younger than Novgorod or Vladimir, but it also has some impressive cathedrals, and cute small churches are scattered throughout the city. 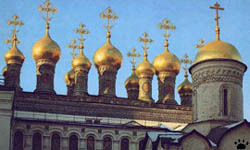 Cathedrals in Kremlin, Moscow, c. 1489 and 1470. Church in Kremlin, Moscow, c. 1627. 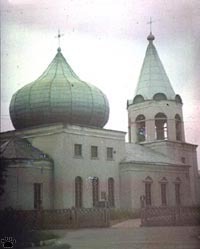 Church in Moscow, c. 1495. 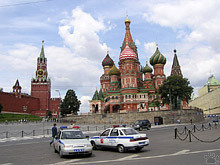 Cathedral in Moscow, c. 1559. Some of these churches date back to the 15th and 16th centuries, others are relatively new. 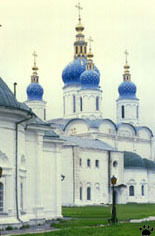 Cathedral, Moscow, c. 1883 (rebuilt 1996). 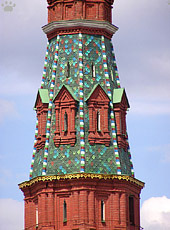 Detail of Kremlin, Moscow. St. 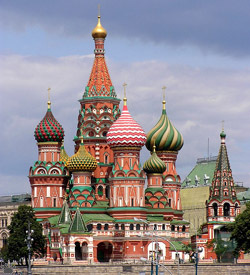 Basil's Cathedral (below) is the most beautiful and popular one. Central Russia, c. 1820. 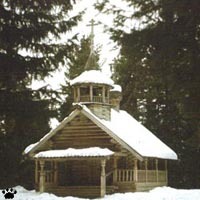 Forests around Moscow are full of small churches, some well taken care of, others abandoned, and known only to local hunters and mushroom gatherers. 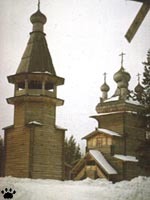 Church, Moscow, c. 1682. 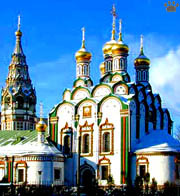 Churches built in the so-called fiery style, mostly dating back to late 16th and 17th centuries, are particularly beautiful in Moscow and surrounding provinces. 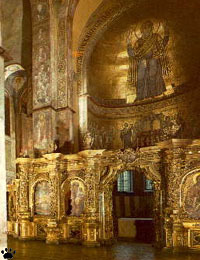 In the late 17th century, the second "golden age" of original Russian architecture ended due to the gradual spread of imported Classicism everywhere, except for the North. 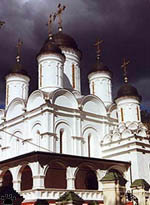 Church, Moscow, c. 1680. 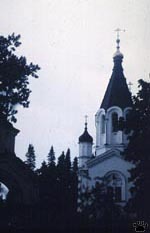 Churches and chapels of Valaam Monastery, Valaam Islands, Lake Ladoga, c.1720-1900. 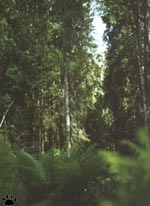 Taiga forest, Valaam. 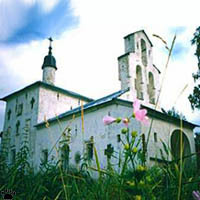 Old monasteries on Valaam and Konevets islands on Lake Ladoga resemble some Far Eastern, rather than European, sacred sites: their architecture is beautifully merged into almost intact natural surroundings. 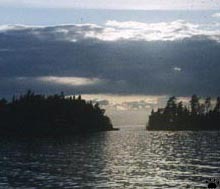 Lake Ladoga off Konevets Islands. 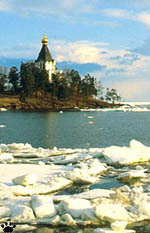 Valaam Islands. 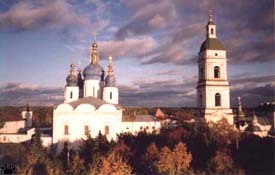 Valaam Monastery. 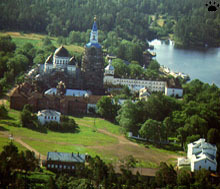 Valaam Monastery. 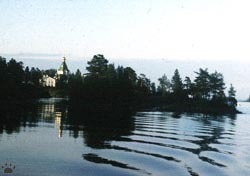 Churches on the western coast of Lake Onega, left to right: Veps church, Russian chapel, Russian church, Karelian church; c. 1650-1850. 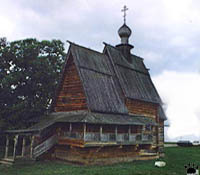 Russian church on Lake Onega, c. 1830. 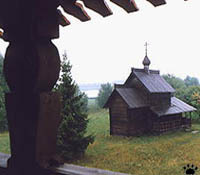 Each one of many small, remote villages around Lake Onega, inhabited by Russians, Karels and tiny Veps tribe, has its own wooden church, and no two of them are alike. 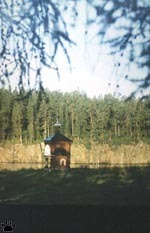 Karelian church on Lake Onega, c. 1790. 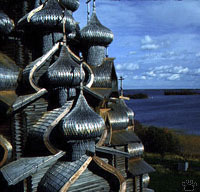 Churches on Kizhi Island, Lake Onega. 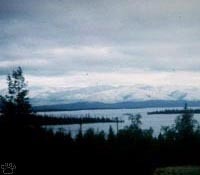 Kizhi Island. 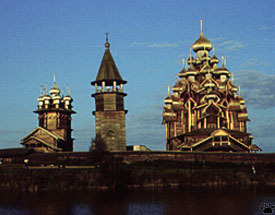 One of these two churches (the one to the right on the pictures) is probably the World's most beautiful wooden structure. It was built entirely of wood, with no nails used, by local craftsmen in c. 1714. It is completely unlike any other wooden church ever built. 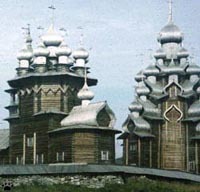 Churches in Malye Korely, near Arkhangelsk, c.1800-1850. 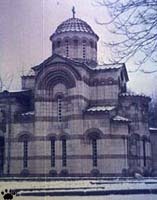 Orthodox monastery. 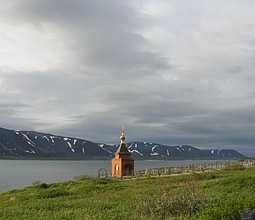 Villages of White Sea coast in the northernmost Russia are generally believed to be the last place where the traditions and lifestyle of the old times are still preserved to some degree. 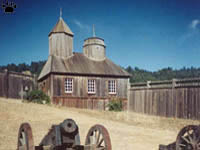 Local churches mostly avoided the destruction of revolutionary years, and people still speak a distinct Pomor dialect, little influenced by TV phraseology and city slang. However, few people realize that Russians are relative newcomers in this area with rich Fennic, Scandinavian and Saamian cultural heritage. kill people who displeased them. 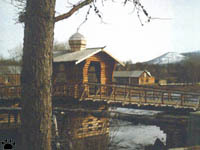 ancient Viking trade center, c. 1660. In addition to churches and monasteries, there are ancient Shamanist shrines in this area. 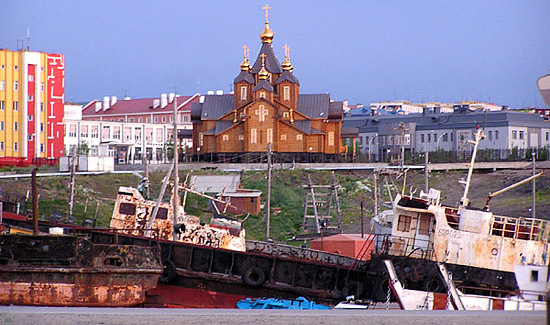 They were mostly destroyed by Orthodox Church in other parts of European Russia. 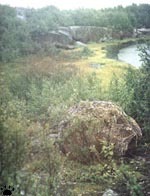 Nowadays, shamanism only exists on the Eastern side of the Urals. 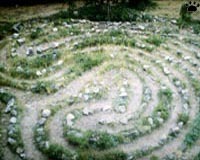 sites of spiritual dancing ceremonies. 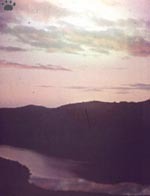 c. 1770-1800. 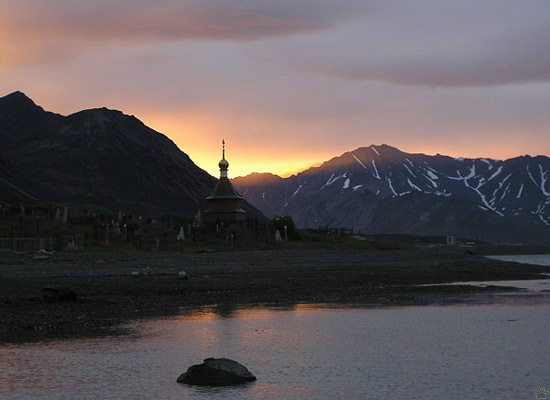 Stone churches are relatively rare in this country of endless taiga forests, but the few remaining monasteries have impressive stone walls. 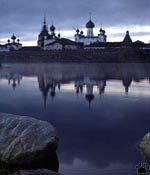 Solovetsky Monastery, the White Sea. 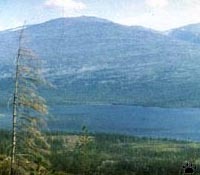 White Sea coast near Kandalaksha. 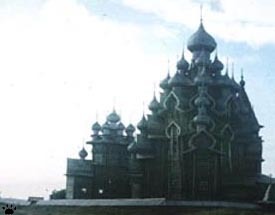 World's largest wooden cathedral, Anadyr, Chukotka (NE Siberia), c. 2004. 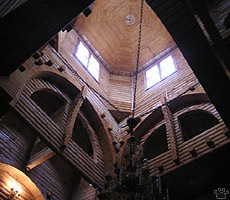 Interior of Anadyr Cathedral, c. 2004. Recently, The government again began to push Christianity down peoples' throats by the government, and new churches are built everywhere. 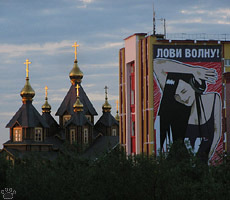 Anadyr Cathedral (and a radio station billboard). 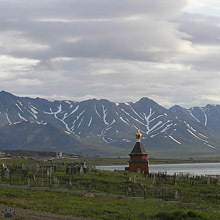 Chapel in Egvenkinot, Chukotka, c. 2005. 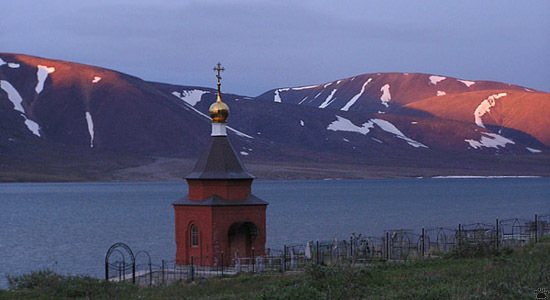 Chapel in Egvenkinot, Chukotka, c. 2005. Most of these new churches are terrible kitch, but some aren't so bad. 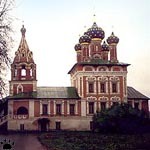 Church in Kolomenskoe, Moscow, c. 1532.